For the longest time, Filipino cuisine has been sitting in the wings, poised to hit it big in the international food scene. Fortunately, this break may come sooner than we think, with our food getting more attention than usual. Non-Filipinos are championing the cause, dishes other than adobo are becoming more popular, and the most chichi restaurants are serving up breathtaking approaches to Filipino fusion. Nevertheless, despite the glamorization of Pinoy cuisine, it’s also important to give credit to the grassroots movement. After all, the Filipino dishes that’s closest to the ones we serve on our own dining tables aren’t the ones served up as dainty amuse bouches in elegant restaurants, but the ones ladled on chipped crockery in hole-in-the-wall carinderias and eateries. 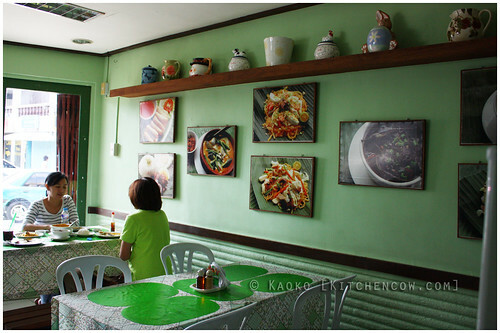 Among these old school eateries, Lola Idang’s stands proud. Despite the absence of tell-tale soy sauce stains rings on their tablecloth, Lola Idang’s is as Pinoy as Pinoy can get. Honoring the legacy of the owners’ grandmother, Lola Idang, this unassuming pancitan offers delicious Filipino food not unlike what your own Lola would feed you during weekend brunches at her home. Hearing good things about their Crispy Pata, we immediately try to order it, but it had sold out. Testament to its goodness? 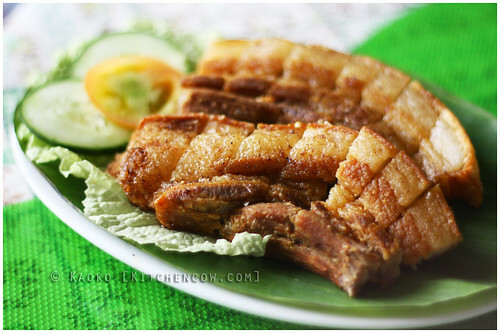 We opted to get the Lechon Kawali instead. It was a good choice and a more than satisfactory replacement. Lightly fried and well-seasoned, the meat was crisp and tender while the skin was light and crunchy. It’s a combination that’s not that easy to get since a lot of places tend to overcook this. 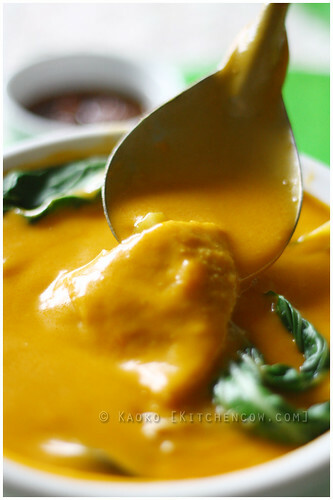 Lola Idang’s is also known for Kare-Kare, so we order a palayok of it as well. Rich and peanutty, the tripe was tender and gelatinous, giving easily against the edge of a spoon. No knives were on the table; we were eating Pinoy carinderia-style after all. Dabbed with a bit of bagoong, each bite, paired with rice of course, was a decadent throwback to summer fiestas. Perusing the menu, the dinuguan also caught my eye. Their version of the ubiquitous blood stew had pig innards, something my mother approved of greatly. It was a bit soupy, which I prefer in dinuguan; more of the thick, sour broth to dip your puto in, or in this case, to pour over the rice. Rounding off our lunchtime feast was a plateful of Lola Idang’s Pancit Malabon. Wonderfully chewy noodles coated by a rich and flavorful sauce, then topped by shrimp, eggs, squid and chicharon. One bite and it’s easy to see how this was enough to build Lola Idang’s name. 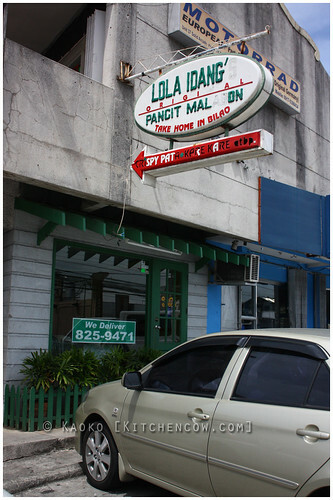 Eating at Lola Idang’s is a wonderful experience. 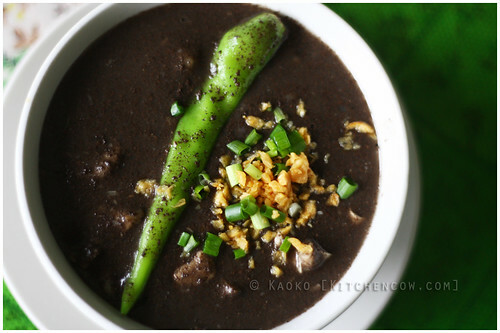 It’s a perfect example of how unassuming yet totally unforgettable Filipino cuisine is. It touches the heart and embraces you, claiming you for its own, no matter what your nationality is. With food as good as this, how can we not conquer the world? 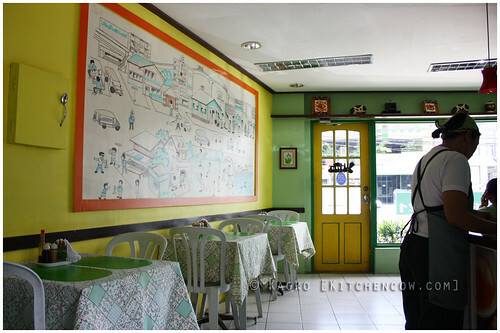 This post is Kitchen Cow’s official entry to the Sooo Pinoy Search for the Ultimate Food Blogger contest. I grew up not liking pansit malabon at all but in recent years, I’ve started to develop a taste for it. Thanks for featuring a new/old place that I can visit! You’re right; Pinoy fusion is yummy but there’s a charm and authenticity to places like Lola Idang’s that’s hard to duplicate. First time I tried theirs, and I agree! Masarap s’ya! Yah, we always buy there if we need pancit before kasi it’s near our old house.. I miss it tuloy! Hands down you should be the winner. Your food pics are dreamy. My dad loves Lola Idang’s. We’ve been eating here for around twenty years already. They used to have a branch in Better Living, I’m not sure if it’s still around. I remember gorging on their halo-halo and pancit malabon. i think the Better Living branch is still very much around. nakikita ko pa sha. havent visited in a while though. but they have this other branch sa United Hills Village where my parents live. also in paranaque. mas madalas ako dyan! love their food! they changed the name sa UHV to Bahay Pancitan eh. but when you ask the staff, branch sila ng Better’s. Wow! Food looks great. I agree. We have been placed in the backburner for so long it’s definitely time for our cuisine to shine. 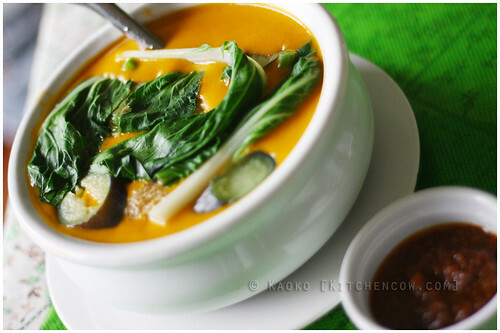 Although I doubt if our Kare Kare will lead the charge since most of our expat friends hate this dish. Reminds them of a really rich curry daw. Hehehe! I don’t think so. It would’ve been cool seeing a real Larry Alcala up close, no? And you know, I kinda agree with you about the kare-kare since it really needs to be paired with bagoong to make it work. Although I’ve heard of a similar peanut-based stew in South Africa, but then, I think their cuisine shares the same plight ours does. 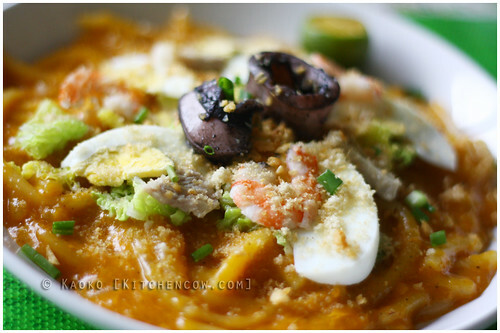 Being raised in Navotas and now living in Malabon, Pancit Malabon is definitely one of the many dishes I love. I’ve never been satisfied with other versions from other restaurants though and I always go back to Nanay’s. Now, I have a new foodie place that serves authentic Filipino dishes to visit. I must try their kare-kare too! This is making my tummy rumble! I must check this place out soon…where is it? They have a lot of branches; the ones I know of are in QC, Better Living (not sure if it’s still up), BF Homes Paranaque and in Bacoor, Cavite. The ones we’ve personally visited are in BF Homes and Bacoor. It’s a good place to be a suki of. The food is good and the prices are insanely cheap!